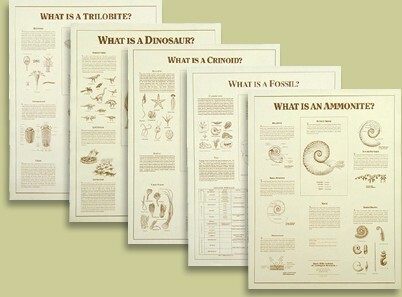 In our ongoing effort to bring the world of paleontology to the public, Black Hills Institute of Geological Research staff created a series of trifold pamphlets and posters with scientifically accurate illustrations and text, easily understood by those uninitiated in the sciences. The titles are: "What is a Trilobite? ", "What is an Ammonite? ", "What is a Fossil? ", "What is a Dinosaur? ", and "What is a Crinoid?". Many of the categories in the Interesting Info section of this web site are based on this material. Available as laminated or unlaminated posters. Credit Written by BHIGR staff and associates, Illustrations by Dorothy Sigler Norton, Science Graphics. Extras Also available as tri-fold pamphlets, sold per title in bundles of 50. See link below. Subject What is a Fossil? What is a Dinosaur? What is an Ammonite? What is a Trilobite? What is a Crinoid?